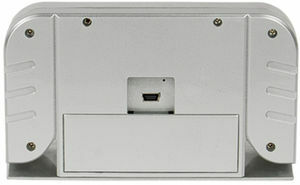 Gray Clock Hidden Camera with IR and Built in DVR. 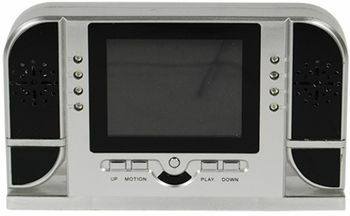 The small gray LCD screen clock hidden camera is a covert camera that can be used to keep an eye on almost anything. It even has invisible IR's that enable you to see 15 feet away at night with this incredible little camera. It records in crystal clear 1280x720 resolution at 30fps and has a 16GB micro SD card to catch up to 10 hours of video footage. The motion detection feature allows you to only record when there is movement and saves storage space and battery life. The battery can last 4 days on motion detection stand by mode. The battery life for constant recording is about 2 hours. 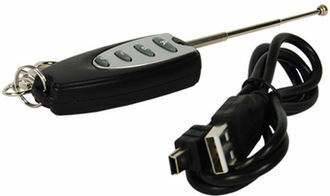 The clock camera is very easy to use with the supplied remote control. Dimensions 4 7/8" x 2 7/8" x 1 1/4"